Throughout my various schooling I've always felt a little dislocated from the classroom and lecture room setting. Whilst some people found it very easy to thrive in the education environment I have to be honest and say I struggled. I struggled in the classroom to make things work for me. My homework would always be above and beyond but during teaching hours I felt like I learnt very little and had to make up for it at home. I knew I was capable, evident in my homework and now my Masters degree, but it's been a long and difficult journey. 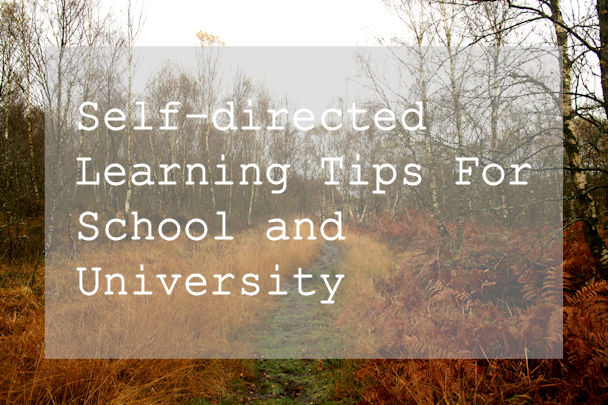 The following tips are what I've learnt from my education experience, and how I've coped with a huge workload after school and outside of university lectures to succeed. Honestly, I have a very on/off relationship with reading but whenever I get into it I really notice a difference. It's inspiring and thought provoking. I used to read like crazy during the summer holidays and I actually think it stopped me going a little crazy when I didn't have a structured school timetable. Even reading the news and being up to date with what was happening around the world really supplemented my general knowledge and ability to participate in class. One thing I did throughout university was attend pretty much all my lectures, regardless of how tired or hungover I was. Me and my buddy Zoe would trudge to our 9am's and make sure we were there, keeping each other accountable. We didn't just sit there though- I found it very difficult to take in all the information that was often being reeled off by the lecturer. We took plenty of notes and made sure to catch up if we missed a lecture for some reason. When I found a topic particularly difficult,I re-read and sometimes re-wrote up my notes to try and get a grasp of a subject. This became really useful when it came to exams as I had a set of notes to go with the lecture slides that I could revise with. This is actually something I really struggled with (and still do) today. I find that the best way I learn is through discussion and interaction with others, but anxiety often got in the way of me participating in class. At Masters level I found it a little easier and found actually many other people were anxious in class. However, I do recall one class where my anxiety was through the roof every week (to the point where I would absolutely dread the class the following week after I'd just finished that week's class) and I didn't mutter one word throughout the whole term. Whilst this was poor of me, everyone in the class was on a different course (and had previous knowledge of the module we were doing of which I did not) and I found them extremely difficult to be in a room with. What was worse was knowing that everyone thought I had absolutely nothing of value to say and that I was frankly, stupid. If you ever feel like this, I highly recommend going to see the tutor running the class and tell them that you're struggling with the seminar environment. The tutor never did any group work or discussion (so I didn't manage to build any friendships in the class where everyone else knew each other), made us do individual presentations each week (which in theory I don't oppose but for me this was terrifying) and had absolutely no understanding how the class made me feel. If i'd have explained and asked her to do group work i'm sure i'd have been way more comfortable in the class as well as getting a lot more out of it apart from being worried all the time! I ended up getting a distinction in that essay for the module much to my tutor's surprise, but being part of the discussion would have really eased me a little into the class. The anxiety I have over being the centre of attention made it difficult to speak in classes, however I found that bringing notes from my reading and research really helped me participate in discussions. It took the stress away from being nervous about the point I was making as well as helping me take away more knowledge and learning from seminars. I also found making a goal of participating once in seminars to really help build my confidence up to a point where I was better able to make use of class discussions. University has the advantage of putting a great mix of different people together. I've always been lucky in that I've had friends that have wanted to achieve and do well for themselves, so have had an interest in working hard, but I have witnessed some groups of people who spent the whole time at university going out and doing minimal work for their degree. Whilst some people can pull it off, I would have majorly failed if i'd have taken this path. Throughout second and third year in particular, I surrounded myself with people who wanted to get a good degree. Afifah was my trusty library buddy who also found working at the library was beneficial to her, and we also went to the gym together to have some chill out time. Sam was also my trusty housemate who i'd go to the library with on a Saturday morning with a flask of tea. My course mates also would spend a lot of time in the library doing their assignments and dissertations. Yes we messed about and had a lot of library breaks, but we also did a lot of work and we all did well because we put in the effort to supplement lectures and seminars. What tips do you have for self study at school and university?